As we strive to get the house ready for sale, looking at all the tasks on the list (as well as all those tasks that haven’t yet made it to the list! ), is overwhelming to say the least. 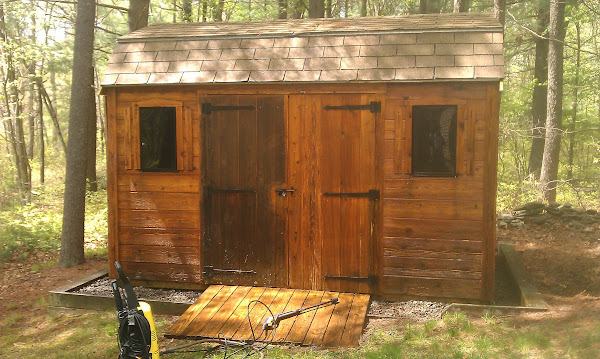 But we have to start somewhere and painting the shed is just as good a place as any. 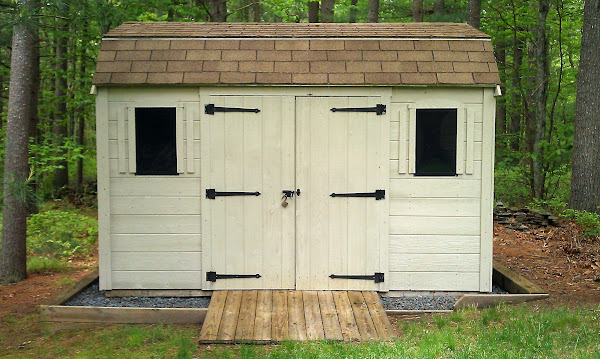 This shed has white cedar tongue-and-groove planking for siding. We have always liked the natural look of this wood so typically used a clear sealer like CWF-UV. This holds up well if you keep up with it, but at this point the weather staining is just too extreme so we decided to paint it the same color as the house. 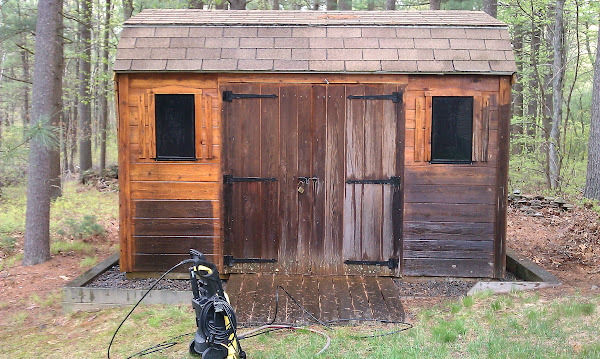 First step was to pressure wash most of the grunge off – wow, what a difference! Still the paint will make it look a whole lot more attractive. Maybe the paint will help resist the carpenter bee’s that seem to just love boring holes in the relatively soft wood. I must admit admiration for the perfectly round about 1/2″ holes they create, but not for the damage they do. By putting your ear to the planks you can actually hear their munching! I’ve been trying to find a way to discourage them and maybe the paint will help. I’ve also put mothball material into the existing holes to hopefully make them go somewhere else. Of course during the washing process the pressure washer decided to give us trouble. Something is amiss with the unloader or motor stop switch, so if you stop washing and don’t shut the unit off within a few seconds it overheats and shuts itself down for about 15 minutes. So another item for the list! Or maybe even a new pressure washer which we really don’t want to buy at this point. We will need one though to finish prepping the house for painting. Also, the lovely huge acorn dropping white oak tree next to the shed, dropped a massive branch on the back edge of the roof last year. This partially stove in the plywood roof and destroyed the drip edge, although considering the size and weight of this branch I’m surprised that was the extent of the damage. I was able to repair the roof and shingles and replace the drip edge so it looks almost like new. So here’s a shot with the first coat of paint applied to the front (mostly by Linda). I think one coat will do the job – this is self priming solid “stain” and the wood is very rough so I think it will hold up well. Only three more sides to go! Linda also wants to paint the trim with the contrasting trim color same as we are using on the house – stay tuned for updates! 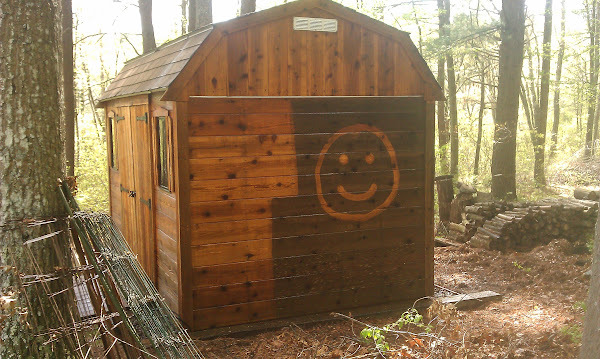 Come on over to our house; our shed needs painting!! !